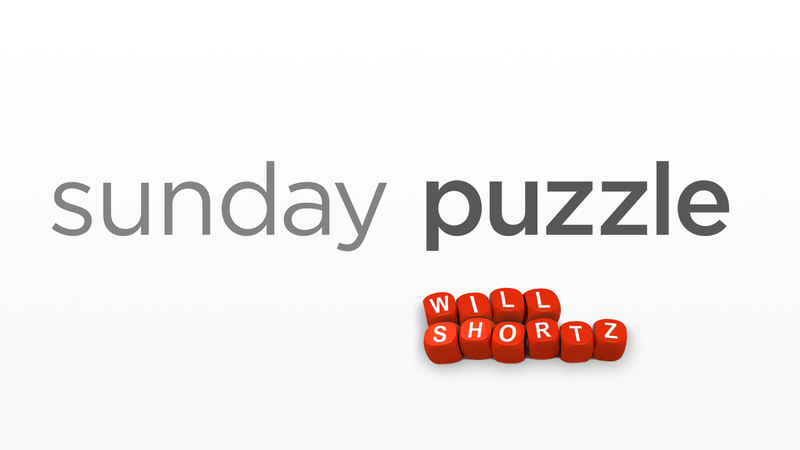 Sunday Puzzle: The Other A-I NPR's Lulu Garcia-Navarro and puzzle master Will Shortz play the puzzle this week with Alec Weisman of San Francisco. 7. Place for a speaker / Spanish greeting "Buenos __"
Last week's challenge: Think of a well-known commercial name in 9 letters. Change both the fourth and ninth letters to X's and you'll get two other familiar commercial names, one after the other. What names are these? Next week's challenge: Name a woman's title. Drop the first and last letters and read the result backward to get another woman's title. Both titles are common English-language spellings. What titles are these? If you know the answer to next week's challenge, submit it here. Listeners who submit correct answers win a chance to play the on-air puzzle. Important: Include a phone number where we can reach you Thursday, July 5 at 3 p.m. ET.